Shooter fans demand constant content, and Activision is going to give it to them. Despite EA's best efforts, Call of Duty is the biggest franchise in core gaming right now. Even my brother-in-law car salesmen recognized any game with a tie-in vehicle is probably a big deal. 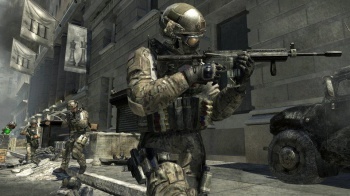 The latest game Modern Warfare 3 launched with a service called Elite that demanded a premium annual subscription of $50 for every piece of DLC released for the game. According to Eric Hirschberg, CEO of Activision Publishing, his team is committed to bring all kinds of content including standbys like extra multiplayer maps, but also special missions and modes. Doing so will make sure that Activision's flagship franchise is "always on". "The idea of giving people constant incremental playable content and making it so you're never more than a few weeks away from the next new experience within the Call of Duty universe is part of what we're experimenting with," Hirshberg said. "This franchise doesn't really behave like most franchises. It's become something of a year-round activity for a large percentage of our player population." Consumer testing of Elite pointed out that gamers want smaller updates more quickly. "One of the things that was most appealing when we were researching these ideas with consumers is the idea of breaking up the DLC so that it comes more often and more regularly," he said. "We want to provide DLC to people more often and also experiment with more of a variety in the forms of playable content." "The nature of this kind of service requires constant iteration," Hirshberg said. That sounds all well and good, but Modern Warfare 3 has been out for nearly two months and to my knowledge (let me know if I'm wrong) Activision hasn't released any DLC for it. Anyone who forked over 50 bucks for Elite might be a little miffed, that's all I'm saying.